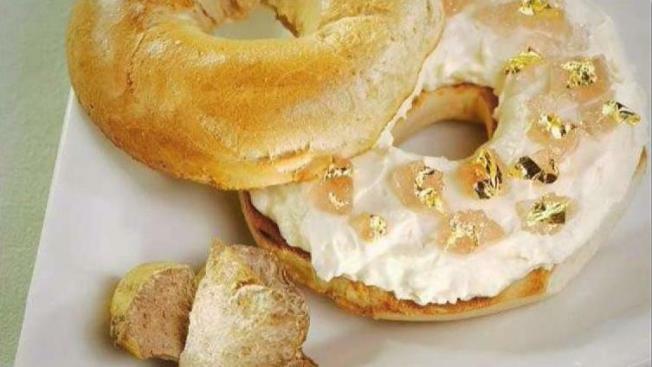 A spokeswoman for The Westin says ever since the $1,000 bagel made its first brief appearance in the fall of 2007, "requests for this over-the-top bagel have come in yearly without fail"
The $1,000 bagel is back in New York City. The Westin New York hotel in Times Square is offering the extravagant bagel for a limited time next month, 10 years after it was first introduced on the menu. The bagel, from New Yorker Bagels, will be dressed in Alba white truffle cream cheese, topped with goji berry-infused Riesling jelly and flaked with golden leaves. Pound for pound, the white truffle is the second most expensive food in the world, after caviar, according to a spokeswoman for the hotel. The delicacy is grown in the Alba region of Italy beneath certain oak trees, and trained dogs or pigs are necessary to locate them. Production of the truffles is extremely limited, and they're in season from late autumn to winter. The spokeswoman says the Alba white truffles are the "star" of the bagel creation and the main contributor to the four-digit price tag. Tax and tip are included in the $1,000 bagel, which is available for order via 24-hour room service or at the hotel's Foundry Bar during breakfast hours. A spokeswoman for The Westin says ever since the $1,000 bagel made its first brief appearance in the fall of 2007, "requests for this over-the-top bagel have come in yearly without fail." "Considering how pricing has risen in the past decade (try buying an apartment for the same price as it was in 2007), this bagel at its introductory cost is nearly a deal," says the hotel. But the bagel buyers needn't feel too bad about such a lavish expense -- 100 percent of the proceeds will be donated to Holy Apostles Soup Kitchen. The $1,000 bagel will be offered from Nov. 1 through Dec. 15 and must be ordered 24 hours in advance.